On Friday afternoon, within minutes of President Trump ending the shutdown, the left declared victory. Dancing up and down on his perceived “grave” the fund raising requests were e-blasted to supporters promising that the day’s events insured already assumed doom for a President they hate. Don’t tell them... but the opposite is now on its way. To see leftwing activists so eagerly cheer the defeat (even temporarily) of some of the most broad-based (and in many instances—Democrat initiated) objectives as it pertains to common sense border security was disheartening. Directing people to the end of the fence, to the “point of entry” is rational—not immoral—as Speaker Pelosi asserts. She asserts as much because of the sinister forces stirring the Democrat base at present. The hard left has such hooks into the party’s base that they have literally forced leadership to completely abandon policy that they supported under President Obama. 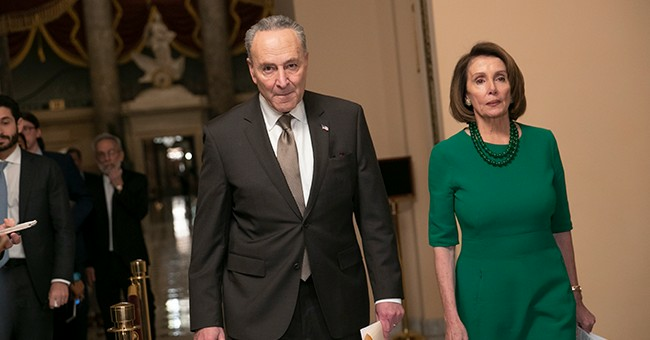 Remember in 2013 Senator Schumer got the entire Democrat caucus to vote in lock step approval for a $40 billion border security package that included upwards of $8 billion in building additional miles of barriers. I don’t say that in some sort of predictable defense-of-partisan-position reaction. In fact it has very little to do with Donald Trump being a Republican. It’s about something much more specific — Donald J. Trump — to be hyper specific. The progressive wing of the Democrat party believed Barack Obama would remake the landscape of American politics. Though he tried, she remains a center-right nation. Once he was sworn in he deregulated largely progressive and politically motivated regulations on small businesses. He rewrote the tax code. We saw manufacturing and production come pouring back into the country. Lowest unemployment and highest labor participation in history. These reforms armed and continue to empower more individuals to have more personal economic options than they had known in the stagnant “recovery” the previous administration oversaw. The left understands this, they were unprepared and are now fighting hard and dirty. Their precious vision of peacenik socialism, coupled with an ample servings of sexual anarchy, religious bigotry, and self superiority is once again slipping through their fingers. They blame Trump for their unsuccessful fights and for this reason they want him gone. They thought Obama was the key. They thought Mueller was the key. They think that Pelosi & the shutdown is the key. The problem for them is Donald Trump is still President. They live in an obsessed existence—pacing the floors at night—dealing with how he’s taking away the vision of what they want America to become. He slept last night like a baby.